Overview - A powerful railroad executive, Dagny Taggart, struggles to keep her business alive while society is crumbling around her. Based on the 1957 novel by Ayn Rand. Special Features: Commentary with writers John Aglialoro and Brian Patrick O'Toole and producer Harmon Kaslow. The machinations of Hollywood can be rather bizarre at times. The rhyme and reason behind some projects getting the green light and others languishing in development hell don't always make much sense, and for whatever reason, even seemingly sure fire hits are often neglected and mistreated. Based on Ayn Rand's divisive but still very much celebrated and extremely popular novel, 'Atlas Shrugged: Part One' is a perfect example of such a beguiling situation. After gaining the rights to the book in 1992, producer John Aglialoro suffered many false starts with several major studios. Fed up with the lack of traction and faced with the fast approaching expiration of his option on the source material, he finally decided to get the film funded outside of the Hollywood system. While I can admire the independent spirit of such an endeavor, this choice led to a very rushed and underfunded project. Though not the outright disaster that some have made it out to be, this bargain basement adaptation suffers from amateur scripting and direction, which when coupled with the novel's already controversial subject matter, leads to a very poorly executed examination of some potentially thought provoking ideas. Set in a dystopian 2016 near-future version of America, the story focuses on a country in the midst of political and economic collapse at the hands of failed collectivist policies. The main protagonist is Dagney Taggart (Taylor Schiling), a businesswoman who runs her family's once successful railroad cooperation. In an attempt to save the company she takes on a risky partnership with Henry Rearden (Grant Bowler) who has developed a revolutionary new metal for train tracks. As the oppressive government tries to thwart their success, a conspiracy develops which sees many brilliant creators and businessmen mysteriously disappearing. Eventually the two plotlines intertwine and it seems that the key to solving all of the story's dilemmas rests in the answer to one question, "Who is John Galt?" Before going any further I think it's important to note that I have not read Ayn Rand's original novel. While this makes direct comparisons to the book impossible, it does mean that my reaction to the film is based solely on its own merits (or lack thereof). The main problem with the movie is its clunky and pedestrian script. Too much of the running time is dedicated to banal political conversation after conversation set in various offices, hallways, and restaurants. Of course dialogue centric films centered on political intrigue can work just fine, but here the characters tend to sound more like ideological mouth pieces than actual human beings and any attempts at insightful character development come across as rather clichéd and trite. The various conflicts that our characters face are never very engaging and while the plot does take a slightly more interesting turn in its last act -- with Dagney and Rearden becoming detectives of sorts in an attempt to unravel the film's central mystery -- it's still rather generic. Ultimately, the movie ends just as things start to get interesting with a conclusion that leaves a lot to be desired. I understand that this is only the first part of a planned trilogy, but as scripted, this opening act doesn't stand alone very well. The low budget and rushed production definitely take a toll on the screenplay, but the performances and actual look of the film are surprisingly decent. With that said, they still aren't particularly good. Though the movie has no big name stars it's likely that you'll recognize many of the very capable actors from various television shows, even if you can't quite place their names. Schiling and Bowler both do respectable jobs in their roles, but never really command the type of presence necessary for their iconic parts, and despite a few momentary instances, their characters are emotionally underwritten to begin with. Stylistically the movie has a very clean and competent look. Some effects shots reveal budgetary limitations but by and large the cinematography gets the job done. Just getting the job done, however, isn't quite good enough, especially for a story like this. Director Paul Johansson (perhaps best known for his acting role on 'One Tree Hill') was brought on to helm the picture at the very last minute and the movie suffers from a lack of vision and creativity, that can't help but leave one wondering what a more experienced filmmaker could have done with the material. It's impossible to discuss 'Atlas Shrugged: Part One' without addressing its political content. Furthering Rand's philosophy of Objectivism, the movie presents a potentially controversial worldview that might end up rubbing some viewers the wrong way. Though I myself have some issues with the content, I want to be clear that my real problem isn't with the ideas themselves but rather how they are presented. In fact, in the interest of full disclosure, my own political beliefs lean toward a Libertarian point of view, and thus I can sympathize with a lot of what the story seems to want to say. Unfortunately, it says it very poorly. The plot champions big business and capitalist ideals so enthusiastically, that it fails to address any of its potential faults. At its worst, the political and economic examination present is so slanted, superficial, and pedestrian that it's almost comical. Since many films and novels focus on the plight of the lower class and often feature dystopias that are the results of right wing policies gone amok, it is indeed refreshing to see an alternative viewpoint and scenario. Injustice is injustice whether it's against the rich or poor, but while I can get behind a celebration of individual thought, merit, and success, there is just something about the film's idealistic, glossy, and downright heroic stance on capitalism and wealthy, brilliant thinkers that feels disingenuous and arrogant (and I don't actually disagree with the core of the viewpoint). The movie seems to paradoxically condemn and condone various types of greed and selfishness all at once. Again, since I haven't read the novel I can't speak to its version of the issues, but based on the book's pedigree I can only assume that the source material presents a much more intelligent and nuanced examination. Right in the thick of such politically and economically turbulent times, when the merits and shortcomings of capitalism and government interference are hotly debated, when protesters occupy Wall Street and detractors cry foul against their efforts, the film's subject matter could not be more timely, which makes its lack of intelligent commentary so disappointing. As it stands, what's featured in the movie really doesn't even warrant all the time I've spent critiquing it. 'Atlas Shrugged: Part One' is a clunky, rushed, and pedestrian film that fails to engage with its plot or characters and unfortunately lacks the kind of intelligence necessary to successfully examine its divisive political content. While the movie features a certain level of competency, the hasty production and budget do hurt the finished project. It isn't quite terrible but it is extremely mediocre and the novel presumably deserved much better treatment. Big fans of the book may want to give the disc a rent merely out of curiosity, but most will likely want to skip it. Plans for the rest of the trilogy appear to be in flux and I can't really say that I'm all that torn up, as I'm still hopeful that a worthy creative team might someday tackle the material. 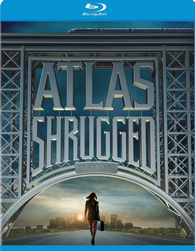 'Atlas Shrugged: Part One' is brought to Blu-ray by 20th Century Fox on a single BD-50 disc housed in a keepcase. Some skippable trailers play upon startup before transitioning to a standard menu. The packaging indicates that the release is region A compatible. Commentary with writers John Aglialoro and Brian Patrick O'Toole and producer Harmon Kaslow. The movie is provided with a 1080p/AVC MPEG-4 transfer in the 2.35:1 aspect ratio. Though relatively low budget, the digitally shot film actually looks pretty decent and at times even exceptional. The source is pristine but a few quick stock footage shots feature some grain. Detail can be very strong, and in a few instances quite stunning. Brightly lit outdoor sequences are the most impressive and feature a pleasing level of dimensionality and clarity with rich colors that pop right off the screen. Unfortunately, the many indoor scenes set in various offices, restaurants, hallways, and bedrooms tend to look less appealing and appear a bit soft, drab, and flat with low contrast. Black levels are mostly consistent and with the exception of some very isolated and fleeting shimmering and posterization, I didn't detect any major technical issues. The film's cinematography is rather mundane and unimaginative but still very competent and technically proficient. There are a few shots that carry an almost breathtaking sense of depth and pop, but the video never sustains those visual heights for long, leading to a sporadically uneven but still good image. The film is presented with an English DTS-HD Master Audio 5.1 track. Subtitle options include English SDH and Spanish. With a few moments of welcomed immersion and decent fidelity, this is a solid but not terribly impressive mix. Dialogue is clean and full with no major instances of crackle or hiss. Directionality is good but the film's very conversation heavy content doesn't really lend itself to much activity. With that said, surrounds do chime in with some fitting ambiance including background chatter, rain, and other appropriate effects. Dynamic range is fine and though I didn't really care for the score, it peaks and swells without distortion. Bass isn't much of a factor but speeding trains do bring some low frequency rumble. Balance between all of the audio elements is handled well. Though not terribly creative or memorable, the mix does an adequate job of complimenting the visuals with appropriate bits of immersion. 20th Century Fox has put together a small selection of special features including a commentary and brief featurette. All of the extras are presented with Dolby Digital 2.0 sound and no subtitle options. Commentary with John Aglialoro, Brian Patrick O'Toole, and Harmon Kaslow - Producers John Aglialoro and Harmon Kaslow are joined by screenwriter Brian Patrick O'Toole for this candid and informative track. The participants spend a lot of time discussing the various details surrounding the film's rushed production and elaborate on some of the differences between the novel and script. In addition to anecdotes about the struggles of getting the movie made, other topics include casting, locations, music, and effects work. At one point the producers actually go on a defensive rant about the film's themes and political views. While I don't completely agree with all of their conclusions, they do make some interesting points, it's just a shame that so little of that intelligence made it to the screen. Though they acknowledge the production's hasty schedule and limitations they seem to be oblivious to the detrimental effects that it all had on the finished product. Mention is made of Part Two (which they hope to get going by the end of the year for an October 2012 release) but I wouldn't hold my breath. Road to Atlas Shrugged (HD, 5 min) - Presented in 1080p, this is a brief interview with the film's producer John Aglialoro. He discusses author Ayn Rand's original novel and details the difficulties he went through to finally get the film made. Though very short, there are some interesting bits touched upon. I am John Galt (SD, 35 min) - During the film's production fans were asked to record themselves saying "I am John Galt." All of the submitted clips are compiled here, which makes this a thirty minute reel of random people saying "I Am John Galt," which is to say that unless you are one of those people, this is completely pointless and a waste of space on the disc. The John Galt Theme Slideshow (SD, 4 min) - This is a slideshow of production stills set to music from the film. 'Atlas Shrugged: Part One' had the potential for thought provoking content, but a lack of both vision and intelligent storytelling instead produced a pedestrian and superficial film. While the filmmakers' intentions seem to have been in the right place, fans of the book deserve much better than this underfunded and rushed production. From a technical perspective, video quality is good and the audio mix is solid. Supplements are sparse, but the producers do provide some worthwhile insights into the movie's troubled production history. Big fans of the novel may want to give this a rent but others will likely find little to like here.